Our great new range of commercial vehicle components includes, as one would expect, a range of rugged door handles for use on personal access doors, e.g. truck cabs and passenger vehicles such as coaches. These push button operated handles have escutcheon and handle in polyamide with zinc die mechanism sealed against dust and road dirt for comfort of use and longevity in service. 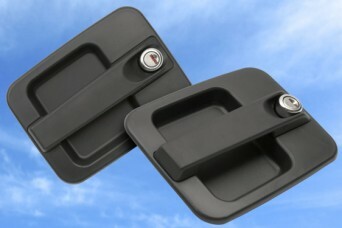 Standard handles are supplied without locking cylinder or with a customer choice of separate barrel and 2x keys. Key selection encompasses up to 1,000 different locking codes with matching door latches and striker plates available to ease installation. Share the post "Door Handles for Cabs and Passenger Access"